Ever-changing payment rules require hospitals, radiology practices, and other imaging facilities to perform more detailed reimbursement analyses to identify where opportunities exist to appropriately maximize reimbursement. It’s important that all radiology professionals understand these four key areas of financial concern impacting the reimbursement process for both professional and technical services. Radiologists, radiology business managers, practice managers, and hospital radiology administrators can work together to address these concerns for mutual benefit. There are several areas where radiology staff interacts with hospital finance personnel to ensure correct coding and charge capture. For the hospital side, the charge description master (CDM) is a great example of where your radiology department may not have control over the data. But if the CDM isn’t set up correctly, it could majorly impact your finances and compliance. While the end result is getting a claim out the door with procedure codes that reflect what was ordered, performed, and documented, the process of achieving that can vary significantly by facility. The number and type of systems that are utilized during charge capture drive the process, but the CDM clearly plays a major role. Maintaining the CDM involves many components. First, it’s important to verify that all line items are present so that all existing procedures can be appropriately captured and charged. On at least an annual basis, each item should be reviewed to ensure that the CPT and HCPCS codes are accurate, address all exams performed in the department, and correspond with correct procedure descriptions and revenue codes. The use of modifiers in the CDM should be evaluated to ensure compliance. It’s also important to identify and address multiple entries for the same procedure. While it’s not technically wrong to have multiple entries for the same procedure code, it can create confusion and make it difficult to determine accurate utilization numbers. A clean CDM should have one procedure definition per procedure code. Finally, the pricing should be reviewed to ensure that each line item complies with the facility’s pricing policy. Many facilities adjust prices annually for overall increases but don’t adjust individual procedure fees. Obtain your facility’s pricing policy and ensure it’s applied to all charges. Low charges could be costing your facility, and thus your department, particularly if your fees are at or below the payer allowables. If a good CDM already is in place, then incorrect coding could be occurring due to a flawed charge capture process. Depending on how your charges flow through your systems, the mapping between the RIS and the CDM may be critical for correct charge capture. If the technologists are selecting charges in the RIS, which then maps over to the CDM, it’s important that these files be frequently compared to ensure that both are up-to-date and accurate. Many radiology administrators have identified this as a key area of concern for their departments and are focusing significant efforts to address it. In many facilities, different individuals are responsible for maintaining the RIS and the CDM files, and there’s no reconciliation process to coordinate their efforts. This lack of coordination can result in missed and/or inaccurate charges. Specifically, you want to ensure that your CDM is mapping accurately to corresponding RIS numbers in terms of the codes themselves and the definitions. Unless you have completed a recent review, you may find several areas of opportunity. There typically is an unintentional disconnect between finance and radiology when it comes to charging. 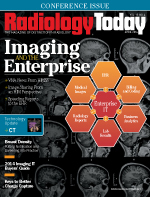 The radiology IT staff is focused on providing what technologists need to capture what they’re doing and not necessarily focused on the resulting charges. In many facilities, the opportunities can be significant. Be careful not to put a specific dollar amount on the anticipated opportunities lest your CFO budgets the numbers to your detriment. I recommend that you compare one quarter’s worth of data before and after the review and update and provide the good news in solid numbers. There’s a growing backward trend of combining designated diagnostic and interventional radiology procedures in bundled codes. The new percutaneous breast biopsy and localization device placement codes implemented this year are the latest grouping of procedures that fall into this category. On the physician side, the new code is assigned a relative value unit, and the professional component charge usually is based on the practice’s current pricing methodology. On the hospital side, this isn’t the case. When the Centers for Medicare & Medicaid Services (CMS) makes an initial ambulatory payment classification assignment, it uses historical data from the previous codes that were combined to build the new code with the goal of collecting accurate charge data and costs from the facilities and making adjustments as needed on an ongoing basis. If the facility doesn’t accurately charge for these services, then the data that the CMS receive and utilize to set future reimbursement are incorrect. The combination procedures codes for CT abdomen and pelvis (74176 to 74178), introduced in 2011, are a good example where it was clear that all hospitals didn’t accurately adjust their charges to reflect the combined exams. The industry quickly saw a 25% reduction in the technical component in the second year of the codes because the CMS responded to the data that it received. New bundled codes will continue to be underpriced unless hospital staff pay close attention to how they’re priced in the CDM and also that all costs of these procedures are reported. They also need to ensure that the CDM is appropriately updated each year to correctly set the charges for the new bundled codes. If the responsibility for pricing resides in finance and not in the radiology department, it’s important to work with the appropriate personnel to ensure that updates are made in an accurate and timely fashion. Don’t assume that this will be handled correctly without your input and guidance. The data each hospital report to the CMS do affect accurate payment in the future. Hospital staff also need to carefully consider how they’re reporting their costs to account for these changes. How well do you work with the individuals who apply modifiers and resolve the edits for radiology services? Every organization generally uses some type of software to ensure that claims are submitted appropriately to the insurance payer. These systems sometimes are called claims scrubbers or front-end editors. They may be stand-alone systems, but usually they’re either embedded into the billing software or integrated into the organization’s information systems. Regardless of how the software is set up, someone with specific knowledge of radiology services must review items of concern prior to billing. The concerns could range from unbundling of codes to the need to apply modifiers to other payer-defined issues. Unbundling is defined as the billing of multiple procedure codes for a group of procedures that are covered by a single comprehensive code. Unbundling usually occurs unintentionally due to a misunderstanding of coding guidelines or an inappropriate charge capture process. The most common examples of unbundling in radiology include coding component parts of a procedure with separate CPT codes (eg, separating an acute abdominal series into a single-view chest and two-view abdomen instead of billing the one comprehensive code) and reporting separate codes for related services when the code for the primary procedure includes all related services (eg, billing for catheterization with an lower extremity percutaneous transluminal angioplasty or stent). The CMS has developed the National Correct Coding Initiative (NCCI) to promote correct coding methodologies, and this is the primary driver of front-end edits. The NCCI identifies certain procedure codes that shouldn’t be used together because they have been determined to be mutually exclusive or one is a component of the other. If a provider uses code pairs that are listed in the NCCI and they aren’t detected by the editing routines in the hospital or physician billing system, the provider may submit unbundled claims. Payers apply the edits to services billed by the same provider for the same beneficiary on the same service date. Most payers use the NCCI edits, and many also use additional proprietary edits (eg, ClaimCheck). As a result, services that are considered separately payable by some payers could be bundled by other payers. Unintentional misapplication of NCCI coding and billing guidelines also may give rise to overpayments or civil liability for providers that have developed a pattern of inappropriate billing. For this reason, it’s important that all organizations have a clear understanding of who’s working the prebill edits, the level of his or her knowledge and expertise in billing radiology services, and exactly what types of issues he or she is “correcting” for radiology. Mistakes occur when staff allows procedures to be billed that shouldn’t be and/or prevents appropriate services from being billed due to a lack of knowledge of the procedures and guidelines. An ideal scenario is either to have an appropriately skilled staff member from the radiology department (hospital/technical component) or coding department (professional component) directly perform this function or, if that isn’t feasible, have input and guidance in the process to ensure inadvertent errors aren’t made. • Who is reviewing/performing your prebill editing functions? • Do you receive information on what codes/billing are changed during the process? • Do you have input on what’s being changed during the process? • Can the current process be revised to ensure that appropriate guidance and feedback is incorporated to ensure accurate billing of radiology services? Regardless of the site of service, providers must ensure that bundling edits are applied before the claim is filed with the payer. Appropriately addressing radiology-specific payer rejections and denials is an often-overlooked opportunity in many organizations. On the hospital side, most business offices are focused on inpatient accounts since they’re the higher-dollar accounts. Unless there’s an abundance of staff, radiology outpatient services rejections and denials may not be handled, which can negatively impact the department. For both the hospital and physician side, it’s important that the cause of rejections and denials be identified and addressed in a timely and efficient manner. If the denial is a coding error, medical necessity concern, or precertification/preauthorization issue, it’s critical that the appropriate individuals be notified so education or system changes can occur. Given the increased scrutiny of claims for imaging services, it’s important to review rejections/denials to identify trends, review/address specific payer issues, work specific denials to ensure appropriate reimbursement, identify key areas for staff education, and/or monitor write-offs related to coding issues to ensure accuracy. All of these items are critical to ensure that all appropriate revenues are captured for the radiology department. While this may seem to be a daunting, if not impossible, task, organizations should put more emphasis on the investigation process involved in payment denials. Track the denials to determine the reason and then educate the staff to prevent future denials. For large health care systems, tracking and trending can be performed by department, office, physician, specialty, and/or procedure. For example, results may indicate that there are more denials associated with services performed by a single physician, and education on proper diagnosis code assignment may result in improved reimbursement. Start by identifying the reason for the denial. Was it inadvertent operational errors (requires correction and refiling), payer-processing error, a lack of modifier recognition, a payer that incorrectly downcoded or changed a procedure code, or a payer that incorrectly applied a managed care discount? Or was it a medical necessity denial? Medical necessity denials can vary drastically from one payer to another. All insurers have their own set of rules, so billing and collections staff must remain vigilant and current on insurers’ rules updates. In addition, it’s important that the practice or facility have written processes and documentation for billing and working denials that are available to all staff and include front-end operations staff so that any areas of concern are quickly identified and addressed in an accurate and timely manner. In this ever-changing financial landscape, it’s important that every organization evaluates its charge capture and billing processes to identify opportunities for improvement. While it may take some time to make changes, providing a smoother work process, increasing patient satisfaction, and ensuring a positive financial impact in the process are worth it. — Melody W. Mulaik, MSHS, FAHRA, CRA, RCC, CPC, CPC-H, is president and cofounder of Coding Strategies, which provides specialty-specific auditing and educational services for physicians, hospitals, and billing companies nationwide.